I’m still sorting through the colossal stack of ham stuff I collected from Mark N9EKG. 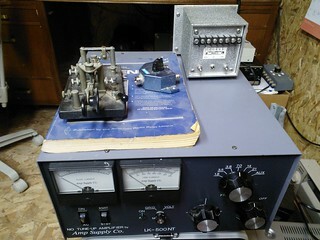 One of the more interesting items is an Amp Supply LK-500NT. Here’s a pic of the amp in my cluttered shack not long after I brought it home. 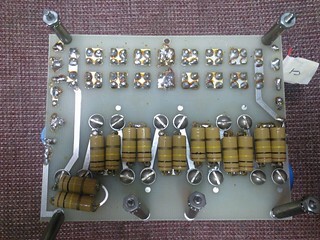 This amplifier uses a pair of Eimec 3-500Z tubes to operate on 160-10M. It differs from most traditional amps in that it’s designed to be no-tune. There are no Plate Tune and Loading knobs. All you have to do is select the correct band for operation and go. There is a fine tuning knob that may be used for making minor tweaks but it’s not always needed. 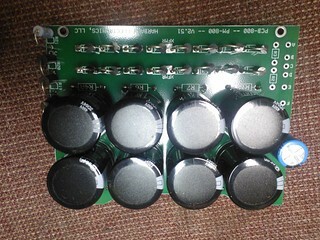 Inside there are banks of air variable caps for each band that are factory adjusted as presets. Another nice feature is that it’s capable of QSK keying for those high speed CW ops. I’m guessing it must’ve been fairly expensive back in the early 1980’s when it came out. 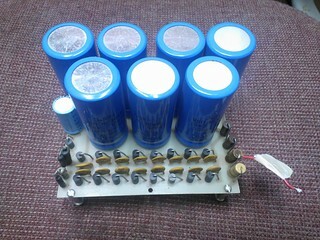 The Amp Supply was pretty clean outside and in, but the high voltage power supply was a little weak. The High Voltage meter was reading about 1000V low. Some of the components definitely looked suspect. To remedy this, I purchased a rebuild kit from Harbach Electronics. I have to say that I’m very impressed with the quality of this kit. 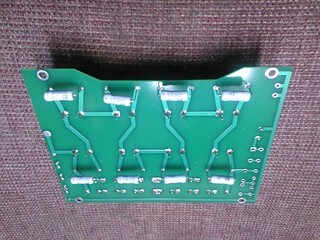 The circuit board and components are top notch. I found the instructions pretty easy to follow. I didn’t have any issues building or testing it. 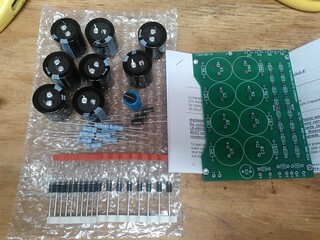 The size of the new components were much smaller when compared to the originals. This made it a lot easier to fit it back into the chassis after landing all the wires in their appropriate locations. Now my High Voltage meter is reading 2800V while idling. I’ve been testing it into the dummy load and seeing around 1000W. The engineers must have been constantly changing the plans because I’ve found multiple different versions of the manual on the web. I’m currently checking to verify what the max currents should be for the Plate and Grid Meters. Don’t what to tear it up. I’m making some final tweaks and it’ll be ready to button up and put into service. If a ham was really motivated, I think this amp could be modified to operate as a traditional amp. With the stock tubes and HV power supply It should be capable of legal limit. But for now it makes a great instant-on no tune amp providing a solid 10db boost when conditions require it. Nice build. I have been thinking about buying the Harbach kit for a Dentron Clipperton-L. Good review on that kit. Next time I’m at casa del LA i-zed I will have to check out that amp.